While a serious injury could threaten your future, our attorneys will help you to carry on with a strong and productive life. 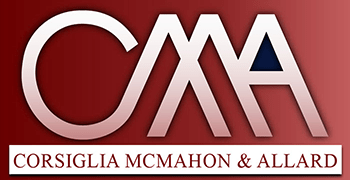 Corsiglia McMahon & Allard, L.L.P. is a leading personal injury firm with a reputation for pursuing and obtaining justice for the wrongfully injured. Our attorneys are formidable adversaries, whether engaged in the art of negotiation or in the midst of challenging litigation. We will not retreat, regardless of the complexity of the personal injury matter. We have an exceptional record of success, using proven strategies to bring responsible parties to justice. If you or a loved one has been seriously or fatally injured in an accident or has experienced a medical mistake, we are wholly dedicated to obtaining justice. From insurance companies to product manufacturers, we will relentlessly pursue every liable party. We have the knowledge, experience, and resources to handle every aspect of your case. The founding partners of our firm have more than 45 years combined experience practicing law in California. Our experience handling California personal injury claims makes us knowledgeable about statutes, precedents and jurisdictional nuances. Our industry-recognized, award-winning personal injury attorneys are solely focused on securing favorable outcomes for our clients. To that end, we surround ourselves with professionals in engineering, medicine, and forensic science to provide sound testimony and in-depth evidence to validate each claim. Do not assume the outcome of any case. Bring your case to us and let us help you navigate this challenging time. While some may believe they have little change to recover compensation, we are experienced personal injury lawyers who will provide you with an accurate picture of your possible recovery and a financial road map for the future. Enduring great physical pain and economic loss can be burdensome. If you need representation for a personal injury claim, we are here to assist you. Contact our firm at (408) 298-7200 to set up a free initial consultation so that we may help you with your next steps. Our staff is fluent in English and Spanish and there is no cost to you until we win or secure your settlement. We serve the Monterey Bay Area area including Monterey, Pacific Grove, Carmel, Salinas, Marina, Sand City, Watsonville, Santa Cruz, Aptos, Soquel, and Scotts Valley, as well as Hollister and San Benito County.